Aimee Gauthier is an art director, graphic designer and multidisciplinary creative thinker in Minneapolis, MN. She has battled asthma, allergies, joint and digestive discomfort throughout her life, even being hospitalized for her asthma attacks when a small kiddo. 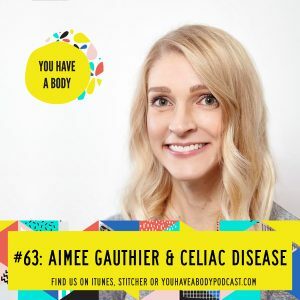 After years of testing, blood work and doctor’s appoints, Aimee finally received the diagnosis of Celiac Disease in her early 20s. Celiac disease is an autoimmune condition where the body does not tolerate the protein gluten (found in wheat, rye and barley products), and ingesting any foods with gluten can cause autoimmune attacks from the body–on the body! This was a turning point for Aimee in reclaiming her health, and it was during this time that Aimee discovered how food can not only be delicious, celebratory, and satisfying, but that it can also truly be healing–and beautiful. Aimee now expertly manages her allergies, asthma, joint pain and no longer experiences digestive symptoms and more through a gluten-free lifestyle, and documents her culinary creations in her recipe blog A is for Appetite! Like what you’re hearing? Great! Leave us a review in iTunes and we’ll send a personal shout out on an upcoming episode to you! Visit Aimee on Instagram, too!